This picture made in the Namadgi National Park is from the dark landscapes projected it is of a traumatic event–the Canberra bush fire. It is also a place of collective memory of the Canberra bushfire of 2003, which was the first confirmed case of a fire tornado in Australia, in which 4 people died, 490 were injured, over 500 homes destroyed, and 164,000 hectares burnt. That burnt area was close to 70% of the Territories total area. It is a site of traumatic history, and it is a photograph made of a place at which the bushfire event occurred over a decade before. As a photographer I came late to the scene and what is photographed is the remaining traces of the bush fire in the landscape. 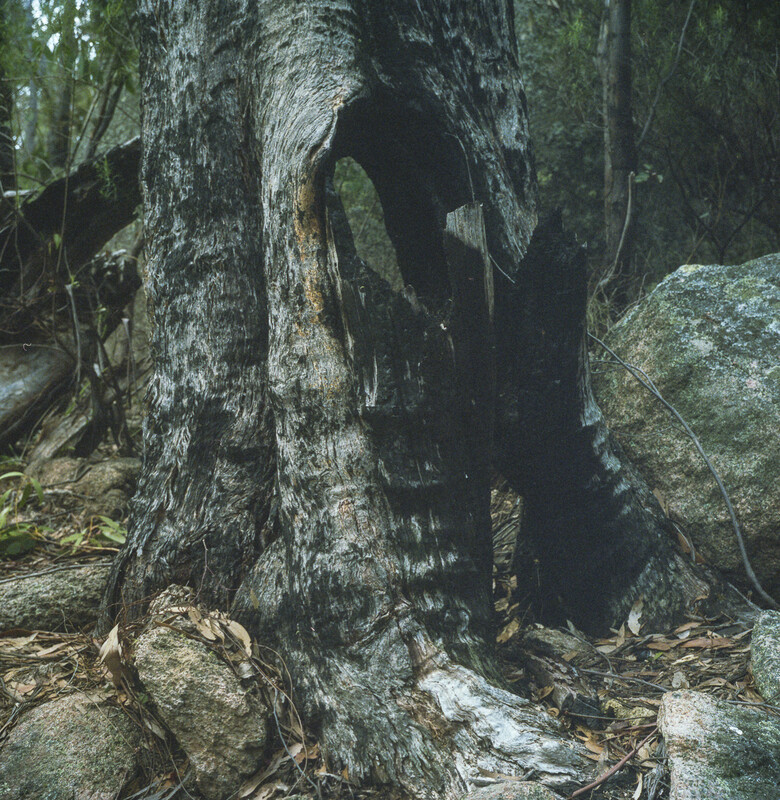 It is a photograph that was taken in a return to a location or site in the Namadgi National Park after the bush fire has happened, and it is made in response to the traces of this event in the landscape. It is an example of what is known as aftermath or late photography ie.,photographs of the consequences of most often of cataclysmic events such as war, displacement and natural disaster. The photographer, as it were, turns up late, wanders through the places where things have previously happened, and photographs the effects of the cataclysmic event. Joel Meyerowitz’s photographs of the aftermath of the collapse of the World Trade Centre—Aftermath: World Trade Centre Archive— is a classic example. Simon Norfolk’s pictures of Afghanistan after the Allied invasion in 2001 is another. The static photograph that depicts stillness is connected to collective memory of the Canberra bushfire well after the bushfire event has been reported on through the image culture of television (eg., video) and the photojournalism in the newspapers. The newspaper constitutes a second wave of interpreted information and commentary. The static, late photograph, with its slow stare and deliberation, of the pictures of the detritus left behind by the event refer to absence as much as presence and, because of this, are inextricably linked to issues of memory. The images present themselves as fragments not wholes, to be read through and against a backdrop of other media representations. In terms of our image culture photography becomes a second wave of representation, returning to look again at what was first understood, or misunderstood through television.